Did you know that on top of Making Tax Digital and the challenges Brexit will naturally throw up, there are further VAT changes planned with the Domestic Reverse Charge due to come in to force in October 2019? Many people are already finding the name confusing as it is in fact a complex new VAT regime for suppliers and customers in the construction industry. The new legislation is moving the VAT obligations from the suppliers of building services to the customer, but only under certain circumstances dependent on two levels of factors. Who will this affect? – VAT registered businesses that are involved in construction, alteration, repair, extension and demolition work including the installation of heat, light, water and power systems; drainage, erection of scaffolding, civil engineering works, site clearance, excavation, foundation works, painting, decorating etc. With the current information suggesting this will include minor as well as major projects. How will this work? – In the first instance it appears Zero Rated projects will be excluded. However the supplier of projects where VAT is being charged, including main contractors and subcontractors alike, will need to check and validate their customers VAT status. If the customer is VAT registered then a reverse charge basis will apply. How will the reverse charge basis work? – Where this applies the supplier will not charge VAT to the customer but simply indicate on their invoice that the reverse charge applies. If the customer is not VAT registered the supplier will need to issue a VAT invoice charging VAT at the correct rate. So the supplier will still need to identify the correct treatment and issue VAT invoices. The VAT registered customers will charge VAT to themselves, presumably paying it directly to HM Revenue & Customs, then claim relief through their VAT Return as normal. What about Flat Rate Scheme users? – This system will not work effectively with the Flat Rate Scheme (FRS) under current legislation. So any businesses registered for a FRS may need to leave the scheme before October 2019. Not being in the correct VAT scheme could ultimately prove very costly. From the customer’s perspective – This legislation has the potential to go beyond the building trade. But it should only be applied if the customer is VAT registered, the work is being received in connection with business and the supply is being charged on. The new provisions should not be applied where the supply is directly to an end user. So where the customer is the end user they will need to make this clear to the supplier. Customers will also need to make sure they do not pay VAT to the supplier where the reverse charge should be applied. If they do they will still be liable for the reverse charge, yet will not be able to reclaim the VAT paid to the supplier as this would be none allowable as an incorrect charge. 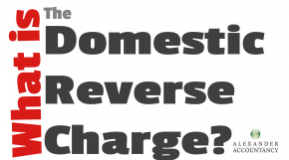 If you believe the Domestic Reverse Charge may affect you and are not sure if you will be ready for it, please email info@alexander-accountancy.co.uk or telephone Burton 01283 743851. We are happy to provide the advice you need, possibly as part of a Free Business Review.